See this article for the 2015 guide. Right. I'm trying to start my Christmas Shopping early. Here, I'm going to share the best stuff I come across. Let me know if it helps you, or if you come across something great! If you're ordering from Amazon, note that sometimes they either don't deliver to RoI, OR the prices they charge to post to RoI are really expensive. Get around that issue by signing up with Parcel Motel. Parcel Motel give you a UK delivery address, which you can use, they get the delivery, and then they put it in the Parcel Motel of your choice. This service costs €3.95 and I've been using it for the last few years. However for most stuff on Amazon, you can now get free delivery in the UK for orders over £10, and free delivery to RoI for orders over £25. Unrelated, but still good to know, is the amazing website CheckArgos.com. If you're based in Ireland, and trying to locate an Argos store that stocks something, it's the most useful site ever! This is the best and strongest portable charger I can find. It is compatible with both Apple and Android devices, as well as tablets. I haven't bought it yet, however the reviews are excellent, and some claim they can get five charges out of this device. This is a perfect present for campers, festival goers, people who are on the road a lot, teenagers who tell you they run out of battery . . . . It's an EC Technology 2nd Gen Deluxe 22400mAh Ultra High Capacity 3 USB Output External Battery . It includes a Flashlight, although unless you're using it for camping, that may not necessarily be a perk for you. Looking to spend a loads and loads of money? Then off you go and get Beats by Dr. Dre. However if you're looking for an equally cool, but more affordable option, check out these gorgeous headphones by Coloud. The headphones start at an amazing €12.50 (up to €25), and include free delivery if you don't mind them taking over a week to arrive. I went with free delivery and they arrived in less than a week, in slick packaging. These headphones actually come with a mic and remote control which are on the cable, so you can even use these headphones for Skype! If you order today, you won't get this in time for Christmas. All credit for finding this watch has to go to the user AlanS181824 on Boards.ie, for his amazing review - read it here. You're not going to find a cheaper Smart Watch. The reason I think it's not suitable for males is due to it's clunky design, which is not dissimilar the Samsung SM-R380 Gear 2 . This Smart Watch is Android or iOS, and This Smart Watch features bluetooth, a mini SIM slot which enables it to function as a standalone phone(! ), a phone finder, a micro SD slot, an earphones slot (to listen to MP3s/radio). It's really easy to use and a seriously impressive present. You can answer and make calls with the watch (either with Bluetooth through your mobile or with a SIM in the watch itself), just like James Bond. Use the code S28GM for a discount (thanks again to AlanS181824 for that code). This is the Fujifilm Instax Mini Camera. It comes with enough inked paper for 20 shots. At the time of writing this, the camera with 20 shots is on special offer, but no harm in checking out the 40 shot version to see if it's any cheaper. If you want to buy more paper, then you can buy that separately . As gifts go, this is not the cheapest idea, but I'm a big fan of polaroids and the fun of having a printed picture, which is actually such a novelty nowadays! I think this present would be a great 'big present' for any child, but also teenagers. If you know someone with a 2015 wedding, they might appreciate this camera . . . could be used to create a unique photo poster (like the tree except with photos), where each guest can write their name on the instantly printed photo, and stick it on the poster. I've been going to Emma Nail and Beauty Care religiously for the last couple of years. I go to her every three weeks and she does my nails, which is both a luxury and a time-saver, as I don't need to bother with any other nail varnish stuff in between my appointments. Anyway, Emma does much more than nails, such as tanning and waxing. She has three different vouchers for sale at the moment, at €99, €77 and €55, which include discounts of roughly 20%. There is also a voucher for a special man in your life. Emma Nail and Beauty Care is based in West Dublin. Buy the vouchers here. Update: Sold Out! I'm including this gift because it's an idea that could also be suitable for children with special needs. This gift is best suitable for young children. It can be used to help explain personal hygiene to children, such as washing your face and brushing your teeth. The product has been carefully designed by Kildare mother-of-two Lorraine Duane, to optimise learning for the children. The child who owns this washbag can practice opening and closing the buttons and other openings. The cost is €30 including delivery to next-day-delivery to Ireland or 3 day delivery to the UK. This fabric calendar features 24 pockets, with a shaped handmade crayon in each. Each Crayon has a 'Christmas shape', like a snowman or Santa shape. While this wouldn't be a gift for Christmas morning, I'm including it because it's so unusual, and also reuseable, which means that it's really good value - as next year you can fill it with chocolate treats, or even buy more crayons from Funky Crayons. 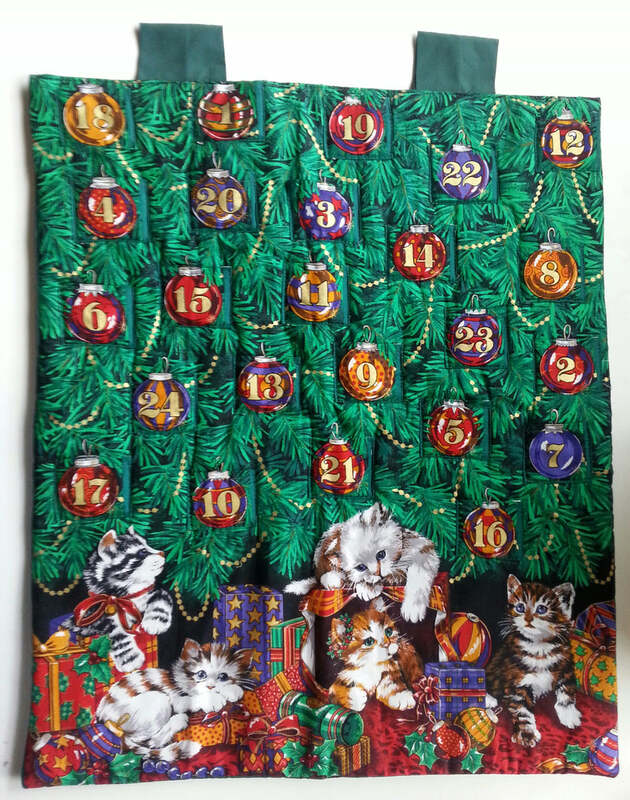 Buy the Advent Calendar here. This is a beautiful hardcover book by Randall Munroe, author of the successful Xkcd: Volume 0 . What If answers all sorts of scientific questions in an entertaining but informative manner. This book is a great present for almost anybody. As you can see, it's a bargain at the moment. I've bought two for Christmas presents. Update: Holly has just been commissioned to work for Cosmo again . . . so if you can't afford a commmision, then you can still buy a limited edition signed print from here!. If you haven't heard of Holly Shortall this year, then you probably haven't been spending much time on the internet, watching TV or listening to the radio. Holly Shortall is Ireland's hottest illustrator right now. Her work has been featured in Cosmopolitan magazine - I could go on. For an extra special present, for an extra special person - order a customised print from Holly. Send her in pictures of your other half, you and your best friend, you and your mammy - and let her do her magic. Get it now. You probably won't be able to afford her work next year! To order, check out her website HollyShortall.com, and then order by email: sales@hollyshortall.com. That's all for now . . . more to come . . . check back soon and please let me know in the comments if you have any cool ideas!